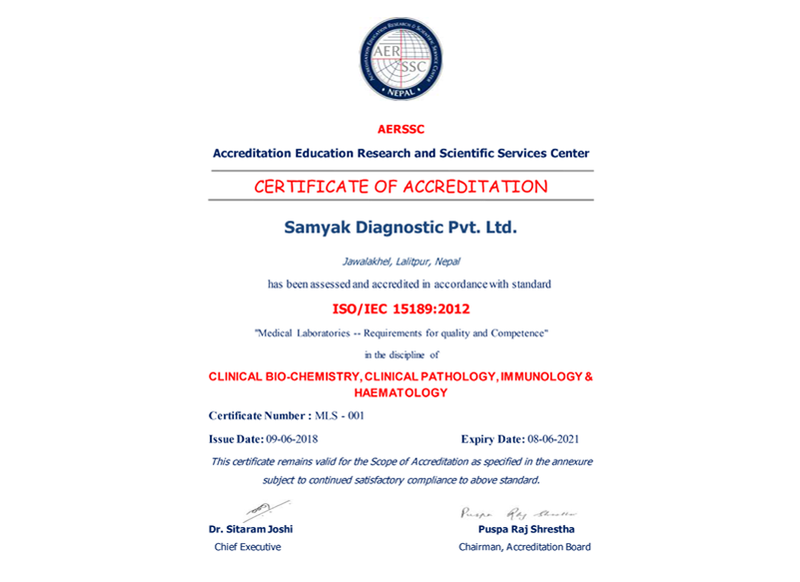 Samyak is the First ISO 15189:2012 certified Clinical laboratory in Nepal and is approved by Accreditation Education Research & Scientific Services Center (AERSSC). AERSSC is an autonomous body established with an objective to provide accreditation services in accordance to the prevailing latest international standards. AERSSC is an associate member of International Laboratory Accreditation Co-operation (ILAC). Since quality has been the first and foremost priority of Samyak, quality management system is maintained through quality planning, quality assurance, quality control, quality improvement and is in conformity with the ISO: 15189: 2012 standards and AERSSC requirements. Documentation of daily records, establishing standard operating procedures (SOP), regular calibration and maintenance, internal quality control, enrollment in proficiency testing (EQAS) with international programs, Bio-Rad, all these have been ensured as per requirement of ISO 15189 and AERSSC. Laboratory quality control is designed to detect, reduce and correct deficiencies in all laboratories’ internal analytical process prior to the release of patient results, in order to improve the quality of the results reported by the laboratory. Quality control results are used to validate whether the instrument is operating within pre-defined specifications, inferring that patient test results are reliable. Once the test system is validated by the pathologist, patient results can then be used for diagnosis, prognosis or treatment planning. At Samyak Diagnostic, quality control samples are analyzed as per recommendation by the ISO 15189/ AERSSC and manufacturer recommendations. The quality control supervisor as well as all the staffs are trained on quality assurance and regularly monitored for their performance. Statistical evaluation of quality indicators is performed in regular basis. Based on the results further planning is carried out to establish the quality services.